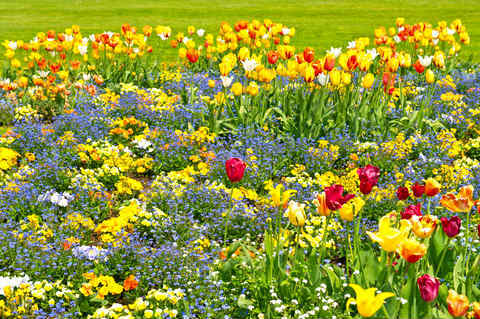 Color and Mood - Design the Garden You Really Want! Color and mood entwine like two lovers at rest. One without the other is lacking its full meaning. The whole is more than it's parts. So it is with the garden, as in any design medium. 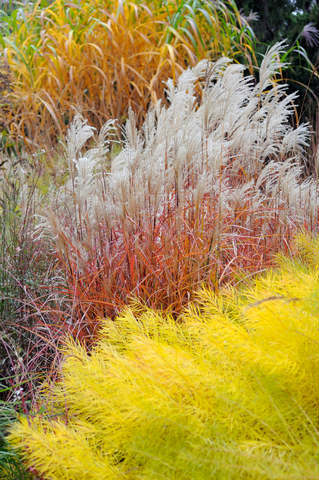 Yet how many of us actually pay attention to the nuances of color when planning our gardens? Mostly we find a plant we love...we simply must have, and we find a place to stick it in. OK...there is nothing wrong with that...! 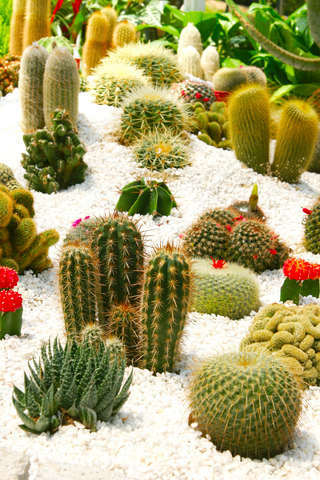 IF you want the average garden! But you are HERE because you want the above average garden, right? 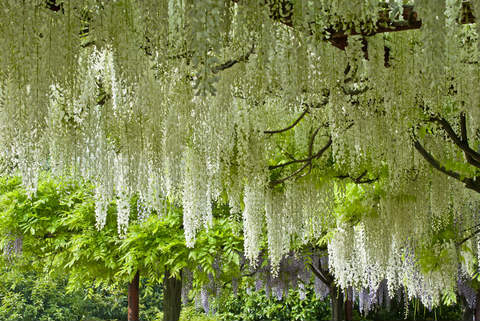 So what is the secret to an above average garden? Well, there are many...but one of the greatest is the understanding of how color and mood are associated. of his method and composition." What does that mean to me when I am planting a garden? How can we "be sure of the method and composition"? 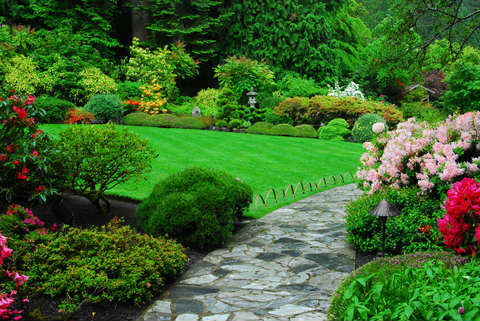 Color and mood are rarely part of the discussion when a homeowner is designing a garden! But design is design, is it not? Will my residential garden design not benefit from a clear picture of the mood I want to create? The answer is YES! Undoubtedly yes. So what are the secrets to color and mood? upon our perceptions of mood. Cool colors create calm, inviting spaces. They help create a quieter effect. To create a quiet effect, use pastel hues and cool colors. 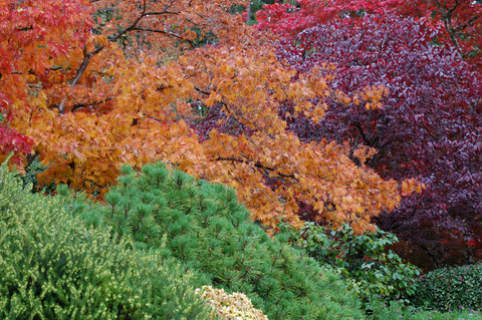 Deep greens, frosty blues and dusky purples are your foliage palette. 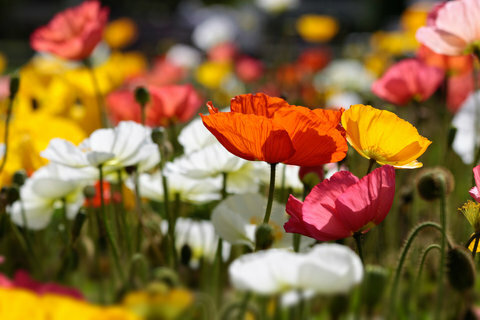 Flower colors, for the most part, are pastels or small pops of color in the entire composition. Can you use vibrant colors? Absolutely...they are a must! But they do not rule the roost! Warm colors create vibrant spaces. They jazz up the garden and provide an adrenaline boost! 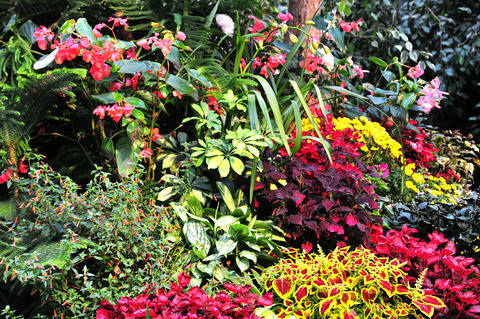 Use bright, sunny colors, such as yellows, oranges, and reds for the bulk of your flowering plants. Foliage palettes of primary green, yellow and lime green lend to the sunny feeling. Bold, brassy, and bright are your watchwords. Do dusty, pastel colors have a place? Of course. But...they are used less frequently! Neutral colors provide the backdrop. 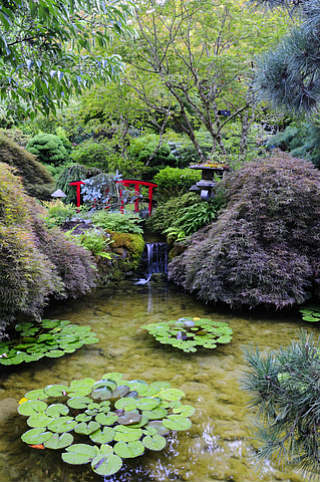 Large expanses of neutrals can enliven or quiet the garden, depending upon their color. Large expanses of white will create high contrast, thus creating more dramatic spaces, while large expanses of brown or green will tend to have a cooling, quieting effect. 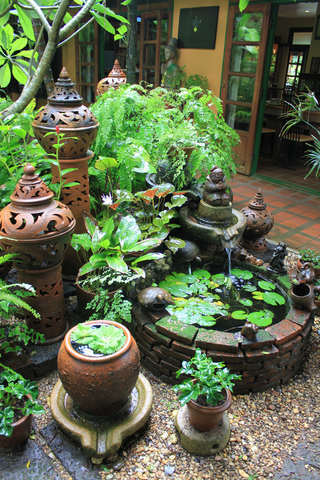 Adjusting the intensity, quantity and color tones of the foliage and flowers in your garden, along with the careful use of plant form and textures, creates a mood. Here we see a quiet, natural feeling mood, a place to go for a walk or to sit under a tree and contemplate. I do want you to notice something however. In the photo above, the rust and oranges [warm colors!] are prevalent, yet the effect is quiet. Why is that? It is because the predominant effect is cooling. The yellow-gold leaved tree is muted. The rust-orange leaves are a brilliant but faded tone. The purple leaves are dominant, and the green neutrals provide a cool base. In addition, the textures and forms of the leaves of all elements of this garden are finer in texture, and smaller in form. Together the effect creates a sense of quiet. Planning for color and mood allows you to select the plantings that will most benefit your desired effect in the garden. You can create that achingly beautiful Monet effect in your own garden, or you can set up your own quiet retreat. Adjust the color schemes, plant forms, and textures to highlight a warmer set of colors and you can create the effect of a seaside resort or a tropical getaway. Let's see this in action, shall we? 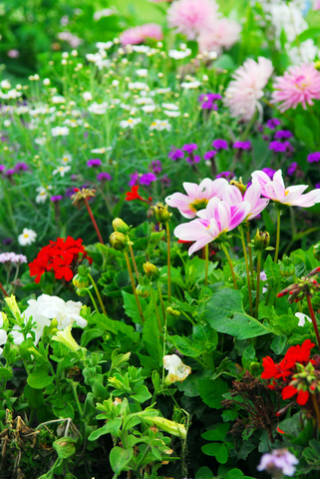 Plantings in either pastel or vivid colors with outstanding characteristics. Wooly and deeply grained foliage contrasted against finer textured plantings. 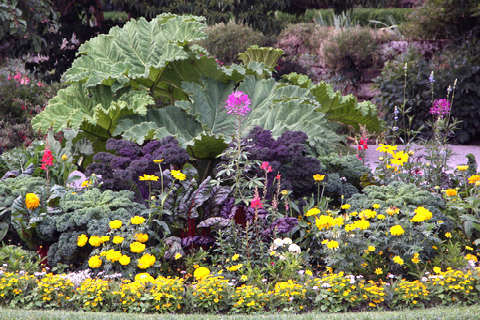 These are just some examples of how planning for color and form will amp up your garden design and make it special! Design is artistry, and artistry is communication through color and mood, texture and form. Be an artist, and design the garden you really want! "The world is your kaleidoscope, and the varying combinations of colors which at every succeeding moment it presents to you are the exquisitely adjusted pictures of your ever moving thoughts."